Unlike the light and airy vibe throughout most of our home, I'm venturing into the dark and moodier side in this space. The room is small (~10 ft x11.5 ft), so going dark was a bit of a design risk - but something I knew the room could handle. I LOVE how cozy the room feels being completely enveloped in a dark hue! It actually feels "larger" too because dark walls can have a "receding" effect. 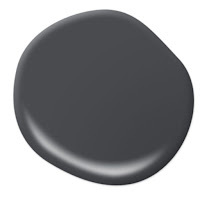 I painted the (other) walls in the same dark charcoal-ish color that I used to paint the accent wall two years ago. 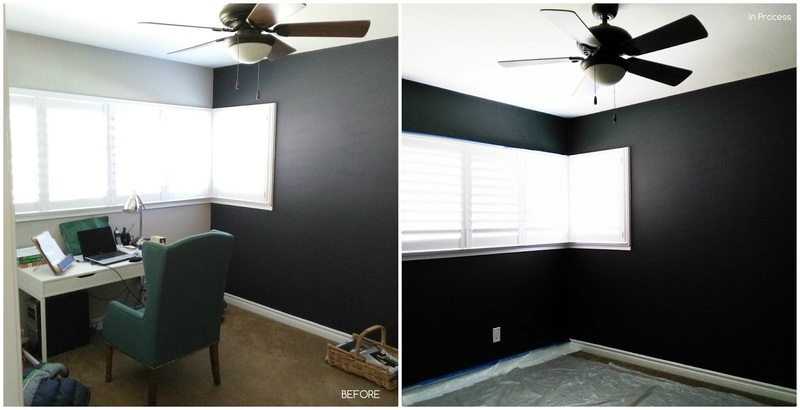 While my hubby questioned me painting the entire room in a dark shade, he trusted the design process. It's only paint, right?! 😜 DESIGN TIP: Since paint tends to dry darker, using a shade slightly lighter than a true black can help alleviate the "cold starkness" common to black in room settings. 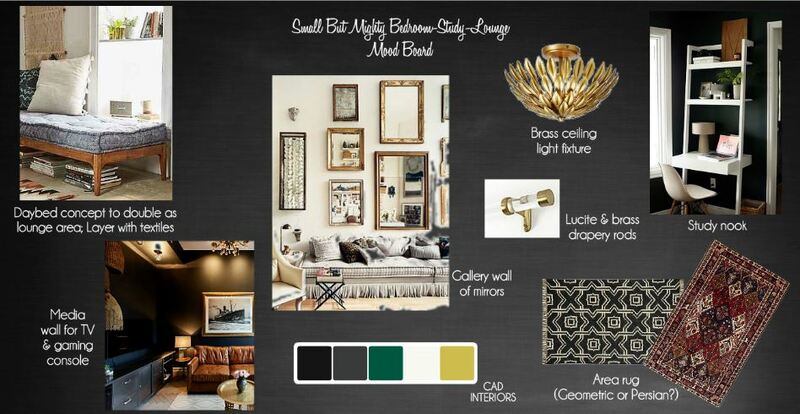 Since I am still sourcing most items for the room - including all the lighting, textiles, furniture, and accent pieces - I thought I'd share the general design direction for our "Small But Mighty Bedroom-Study-Lounge" in a mood board format. I envision a cozy and inviting room with slight casual sophistication (via brass elements and mirrors), modern-meets-old world (via patterns and eclectic decor), and layered warmth (via natural textures and textiles). I'm planning to pull the trigger on some items this week, so stay tuned! Its going to be so pretty Carol! This is Sugumaran from Intentway IT solutions, pondicherry (India). We are working in floor plan designing in Adobe photoshop last 1 year. Please provide me jobs i will serve any time if you serve job for me i will provide my sample floor plan designing files. This is going to be gorgeous! I really love your inspiration and the gallery wall of mirrors. Great tip on the paint color, too. That "moody" art is fantastic! Thank you, Julie! The gallery wall of mirrors is my favorite aspect of the design. I'm hoping to curate a selection of thrift/antique and new! heck yeah! love those dark walls! It's the ORC season for dark walls. Fist bump! This is going to be so good!!!!!!!!! I really like it all. I normally go for Persian, but I like the Geometric one as well, it has a boho aspect to it versus the full blown geo that everyone tends to go for. Carol you know I am a huge fan of those dark walls! This is definitely going to be a mighty space when you're done with it......love the design plan!! Can't believe it's the 1/2 way point... I need more time simply due to my indecisiveness. :) Have a great weekend, Tee! I love the dark walls--also the geometric area rug! I think it's going to be so beautiful when you're done. Loving the dark walls. So dramatic and I agree they do make the walls recede. Looking forward to seeing the transformation. The room feels so cozy with the dark walls. I can't wait until it's put together so we could enjoy the space. Thanks for following along!